This is half the story I told at the Tad’s story telling night. I started to write it out, but then decided just to wing it. A few years back I found myself working at a mental health facility. Calling the place a mental health facility was a bit misleading because most of the people who lived there were crazy. My job title was mental health counselor—but I soon found out that the lion’s share of my job consisted of tasks that were a lot more grubby and hand’s on then counseling. I cooked dinners, cleaned up extremely filthy rooms, gave out meds, and did a lot of group events in the Community Center; a sort of giant lobby where I played cards with residents, made them snacks, asked them to please dress more appropriately, ran art groups and so on. It was like one who flew over the cuckoo’s nest except I was somehow both Nurse Ratchet AND McMurphy. There were two pets that lived in the lobby; Edward the guinea pig and Flowers the rat. I’m not much of a rat person, but Flowers the rat, was a favorite with some of the clients, particularly this one lady named Betty who always carried Flowers the rat around on her shoulder, and gave it little kisses, and let it eat cheezit crumbs off her lips, like a pet canary. I was disgusted, but I said nothing, it was a therapy animal. This was Betty’s therapy. 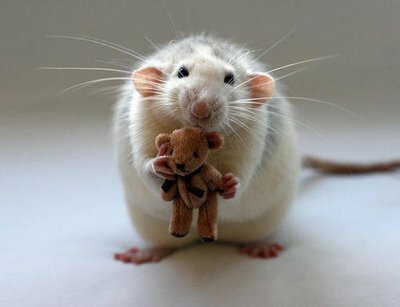 The rat seemed, well rat like, it soaked in all the attention, with it’s beady little eyes, it seemed to smirk at me, like it was thinking – look what I’m getting away with, while it sat on the community table, during the Bingo hour that I conducted on Thursday evenings, and it took sips of Dr. Pepper straight from the can. But me and Flowers the rat had an understanding. You stay over there, and don’t get your pink, scaly little rat tail anywhere near me, and everything is copacetic between us. Fine. Then one day Flowers the rat got mouth cancer. He grew a big tumor on the inside of his mouth, bout the size of a big piece of bubble gum. The vet said this was pretty common for rats, and gave us some medicine to administer tothe rat. The problem was that Flowers didn’t want to take his medicine, and he couldn’t eat with the tumor in his mouth, so he was starving to death. Well, somebody on staff had to help Betty administer the medicine. We drew straws and guess who got the short straw. I demanded a recount but it was no good. I’m a squeamish person, and I think when the other staff saw me go green in the face on drawing the short straw that sealed my fate. So here was the plan. I was to put on a latex glove and hold the rat cupped in my fist, while Betty force fed the rat the medicine. This was the agreed upon plan. It was simple. With my manly grip I would keep the rat’s little matchstick arms pinned to the side of his body while Betty force fed the rat his medicine from a little plastic syringe that had no needle, just the little pointy tip, small enough to jab in the rat’s mouth. We had to work in total fluid harmony. So I snapped on the latex gloves and steadied the rat, and we began the operation, but Mr. Flowers the rat really, did not want to take his medicine, that little guy fought with the strength of 7 rats, squirming, writhing, and flailing, I don’t know if you’ve ever tried to keep a rat still in you hands by gently squeezing it before — but let me tell you they are really agile and strong little devils. To make matters worse, Betty was really attached to the rat, and was being overly cautious about giving the rat the medicine, making these ginger little mincing gestures at proffering the rat his medicine, which he refused, wiggling and knocking his swollen, tumor infested mouth about (there was a slight bulge on one side of his cheek) while she, made her tentative, feckless little pokes with the syringe. “Come on lady—just give him the medicine!” I was yelling. I wasn’t having fun, and neither was Flowers. Neither was Betty, it was like trying to refuel a plane in the air, while the copilot of on the of the pilots is trying to jump out of the cockpit. it was like some crazy video game, the rat as flailing , I was trying to steady the target, the syringe was stabbing and swerving all over the place ” and I was yelling encouragement” Come on, stick him, he’s gonna get away, ” the rat ahead by, sort of sucking in his breath and shrinking managed to pop 2 thirds of his body free from my grasp, and was wiggling free a hind leg, and getting ready to make a leap for it, when Betty finally made her strike, raising the syringe up like she was He-man summoning the power of gray skull and then plunged the harpoon homeward— summoning up all of her strength and aim , she drove the syringe into Flower’s the rat’s mouth like. This technique was quite effective, too effective, and it punctured the rat’s tumor, which popped like over inflated bike tire. Tumor substance exploded everywhere where, like someone uncorking a frothy bottle of champagne—this white pus stuff that smelled like rotting bleu cheese. So I totally lost it, and not very gently threw Flowers the rat to the ground, and ran yelling and freaking out, out of the room, covered in rat tumor pus. Flowers on the other hand seemed almost immediately much better, much happier and calmer, because we had in the uh, operation, successfully removed his tumor. So he was fine after that.